Cruising the internet as I’m apt to do, I just came across a Mancunian Generation X of a blog about the joys and emptiness of living in the city centre. RenterGirl lives in Dovecot Towers and writes of a fairly lonely, natureless existence pockmarked by the odd Eastern European gang murder and a constant barrage of early morning wake-up shouting courtesy of students returning from some club or other. 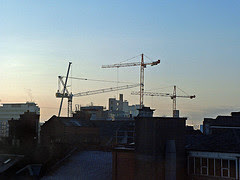 Is this the legacy of Manchester’s recent building boom? Block after block of ‘prestigious’ (?!) new developments going up unfeasibly fast only to be filled with twenty-something serial tenants, paying off student loans and rattling around their open plan living spaces bedroom mezzanines. It smacks of a souless distopia. Perhaps I’m being pessimistic in my sudden horror that indeed, all city centres might be like this and those of us somehow drawn to city living are doomed to the RenterGirl experience. Eventually, ornery folks like me decided to get in on the act and start blogs detailing the minutiae of their humdrum existences from their fury at milk having gone sour to diatribes on the meaning of Pokemon. Various actors and artists have quickly siezed upon sites such as YouTube as conduits for expression and more recently, actual famous people have started using the internet and its inherently viral mechanism (and small world properties) to further promote themselves. Here are video blogs from (in order) Chris Crocker, lonelygirl15, P.Diddy and Imogen Heap. This seems to me to typify the transition from the internet as a means of distribution of traditional media to a medium in its own right, with the production of film solely for internet transmission. Joss Whedon (of Buffy fame) along with various less well known collaborators is the latest fairly big name to have dipped his toe in the water with the low-budget, three act musical video blog Dr Horrible’s Sing-Along-Blog. This foray into internet television is a direct result of this year’s writers strike which left Whedon twiddling his thumbs for a few weeks. It is designed primarimy as an experiment on the financial viability of online media. The show itself is divided into three parts, with a staggered release throughout this week. The last of these will be released on Saturday at which point all three may be watched back to back and for free. After Sunday, they become available as a DVD and at a premium. It will be interesting to see how this all pans out (though I suspect Whedon has nothing to worry about since it is already topping the iTunes chart). Check out the trailer below.